Nickel 200 is commercially pure (99.6%) wrought nickel. It has good mechanical properties and excellent resistance to many corrosive environments. Other useful features are its magnetic and magnetostrictive properties, high thermal and electrical conductivities, low gas content and low vapor pressure. 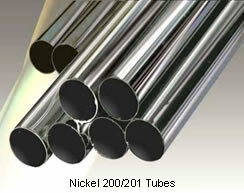 Nickel 200 is normally limited to service at temperatures below 600°F (315°C). At higher temperatures it’s products can suffer from graphitization which can result in severely compromised properties. For service above 600°F (315°C), Nickel 201 is preferred. Nickel 200 and 201 are approved for construction of pressure vessels and components under ASME Boiler and Pressure Vessel Code Section VIII, Division 1. Nickel 200 is approved for service up to 600°F (315°C) while Nickel 201 is approved for service up to 1250°F (677°C). Nickel 200 is highly resistant to many corrosive media. Although most useful in reducing environments, it can be used also under oxidizing conditions that cause the development of a passive oxide film. The outstanding resistance of Nickel 200 to caustics is based on this type of protection. In all environments, when temperatures above 600°F (315°C) are involved, the preferred material is Nickel 201. Nickel 200 may be annealed over a wide range of temperatures above its recrystallization temperature. For heavily cold worked material, temperature may be as low as 1100° to 1200°F (595° to 650°C), but from a practical viewpoint, the range is usually about 1300 to 1700°F (705° to 925°C). Because of the absence of a quantity of residual elements and secondary phases that tend to inhibit grain growth in more complex alloys, grain growth is rather rapid in Nickel 200 at elevated temperatures. At higher temperatures, time at temperature must be carefully watched in order to exercise control over grain size. Batch annealing in box, retort, or open furnaces is usually performed in the range of 1300° to 1500°F (705° to 815°C) for about 30 minutes to 3 hours, depending on cross section and amount of contained cold work. Nickel 200 has relatively high thermal conductivity so that heating rate will be relatively rapid. Cooling rate is not critical, and quenching is not necessary except as a means to shorten the heat-treating cycle or to partially reduce any surface oxide developed during heating or cooling in an oxidizing atmosphere.